This chic bob is blow-dried to smooth the hair with large kinks added to the mid-lengths, while turning the ends slightly out for a fabulous finish. The grown out bangs are worn down in front of the face and completes the overall look brilliantly. Regular trims are needed to maintain this hairstyle. Our model looks flawless here in a modern and edgy blunt bob with large mermaid waves throughout. 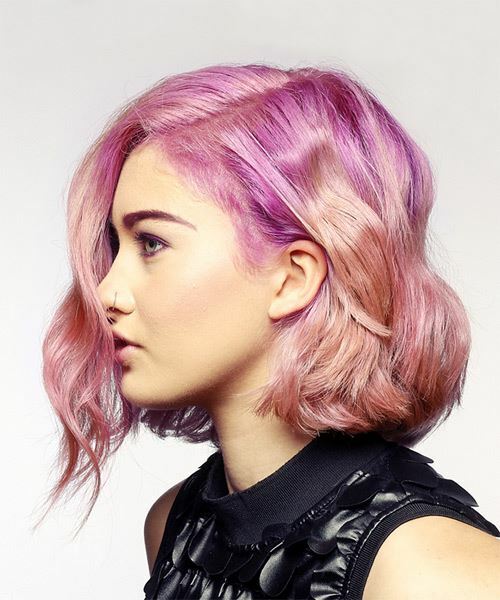 This cut is ideal for showing off her strong facial features with an interesting peek-a-boo effect. The grown out bangs provide her face with a nice frame while the rest of her hair maintains a smooth finish, with large waves added throughout that fall just past her chin. The blunt ends give her locks a healthy appearance and keeps her hair looking thick. This â€˜do has lots of movement to it and works with both casual and formal attire. It also makes her tresses appear thicker thanks to the cut and random waves throughout. For added style, the front is left longer than the back for a chic, graduated shape. 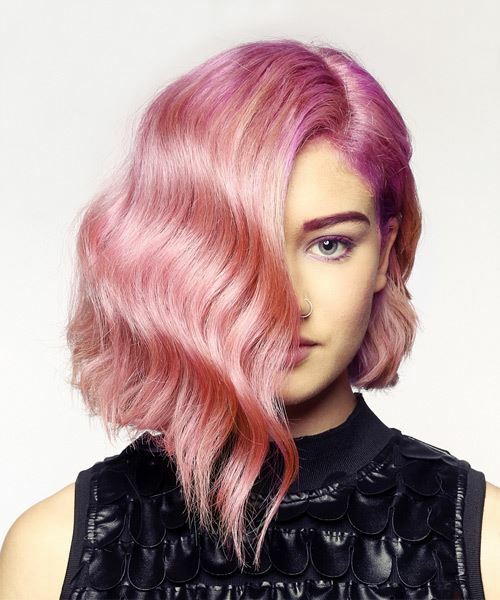 Our model looks fabulous here in on-trend pink locks that flatter her skin tone and eye color nicely. Having light blue eyes and a cool, fair skin tone, she looks best in beige and platinum blonde shades, as well as bright and bold shades like this pink. This particular color has dark magenta roots and lighter cotton candy pink ends that highlights her cool complexion and makes her eyes, and especially her eyebrows (which have been colored with a magenta pencil to match) pop. This color needs regular touch-ups to keep it looking vibrant and bold, as pastel colors tend to fade out quite fast. Use a waving iron or three-pronged curling iron to create this look in the hair. Starting at the nape and working your way up, take a small to medium section of hair and clamp it between the barrels of your curling iron. Hold the hair for 5 to 10 seconds and then release.